“Feverish images and words proliferate like coral through the depths of insomnia. I feel I won’t be able to sleep well until I know everything, until I have reviewed every detail and thread of the story. There isn’t a blank space behind what could have been the final period of that fateful shot. 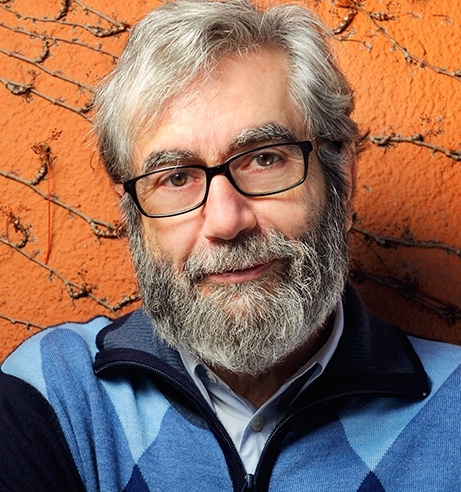 And a shot does not exhaust and does not even summarize what happened in that instant, at six in the afternoon, six and one minute.”—Author Antonio Munoz Molina on his own involvement with the story of Martin Luther King’s assassination on April 4, 1968. In this fascinating, involving, often hypnotic novel, Spanish author Antonio Munoz Molina creates a compelling story from several points of view and several different time periods, revolving around the life of James Earl Ray and his eventual murder of Martin Luther King in Memphis on April 4, 1968. Munoz Molina gives Ray’s story a different slant from purely journalistic accounts, concentrating on his life, his past, and his thoughts, and culminating in his two escapes – the first time in 1967, a year before the assassination, when he escapes from a Missouri prison and moves throughout the US and Canada for months, eventually living in Mexico. 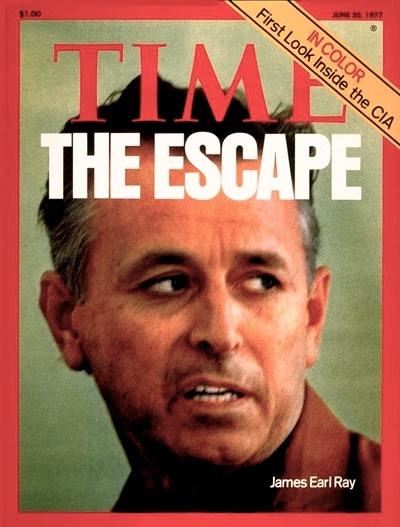 Leaving Mexico in November, 1967, he returns to the US, supports the Presidential campaign of George Wallace, has some facial reconstruction surgery, and considers emigrating to Rhodesia (now Zimbabwe), then under the rule of a white minority. Eventually, he gravitates to Memphis, where he commits the murder of Dr. King and escapes, first to Canada, then to London, Lisbon, and back to London, where he is apprehended. Though Munoz Molina often details the thoughts of James Earl Ray, he uses an unusual third person point of view, combining his journalistic skills regarding events and places with the fictionalized inner personality and emotions of Ray as he lives and travels, providing a kind of literary energy which goes beyond the limits of narrative reporting. Shortly after this introductory section, Munoz Molina introduces himself at home in Granada, Spain, in 1987, almost twenty years later. A young government worker, age thirty-one, he likes to regard himself as a writer, having little in common with his work colleagues. Outside the office, he leads a fragmented life. His wife works in Madrid and lives there with their young child, and she is expecting their second baby. They see each other for three-day weekends, alternating between his place in Granada and hers in Madrid. “I was a father and a husband, and also a foolish adolescent,” he tells us, “an apprentice in the art of the novel and a bureaucrat.” He believes that “real life is elsewhere, that imagination is richer and more powerful than reality, and…fiction more perfect than the dull repetition of reality….” Though he started his first book the month before his first child, now three years old, was born, he always got stuck or bored, and it is far from finished. Though he has entitled it “Lisbon,” he realizes that the book has nothing at all to do with Lisbon. “I did not know how to create fiction from the world I saw around me, or invent characters with lives similar to mine…I lacked vision. I was incapable of imagining the breadth of the future.” Having had this sudden realization, he decides that he must go to Lisbon to research his novel immediately, and though his wife has just given birth to their second son, he takes off for a long weekend, seeking some sort of satisfaction there, just as James Earl Ray did at the end of his final escape. 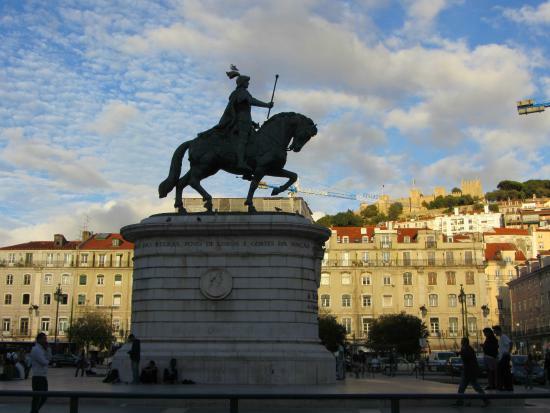 The statue of King John has dominated Praca da Figueira in Lisbon since 1755. The third narrative line takes place in February, 2014, twenty-seven years after the young writer had his epiphany regarding Lisbon and his first novel. Now a successful author of almost two dozen novels (six of which are available in English), he has returned to Lisbon from Spain with his youngest son, who is now twenty-seven. He reminisces about how he always feels when the writing of a novel nears its end. “A novel is like an ember that must continue glowing beneath the cool ashes after the flames have died, an ember that you must carry in secret, while you get through everything else that occupies your life besides writing.” When a book is finished, he says, a feeling of “lightness” and a “quiet happiness” fills your soul, even though you realize that you will spend additional months editing, re-writing, and tightening the narrative. Munoz Molina enjoys talking with his son about the son’s job of translating documentaries about travel, and “visiting” these places through his work. Suddenly, a feeling of exultation overwhelms Munoz Molina, and he decides to find out more about James Earl Ray’s time in Lisbon before his final arrest, to learn every possible detail about that time – and to write this book about it. 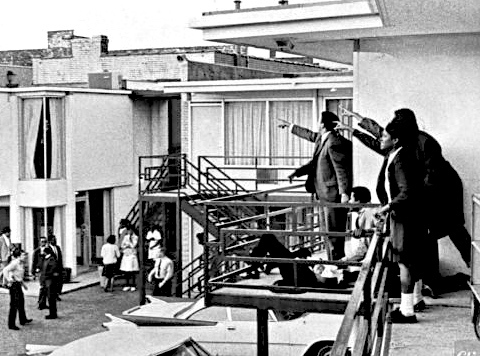 The Lorraine Motel in Memphis, where Dr. Martin Luther King was assassinated by James Earl Ray on April 4, 1968. The shot came from the corner window being pointed out in this photo. The final section, which may be controversial for some readers, returns to James Earl Ray, as he writes in jail, bent on convincing the courts and the world at large that he is innocent of the murdering Dr. King, that a man named Raoul or Roual was the guilty party. 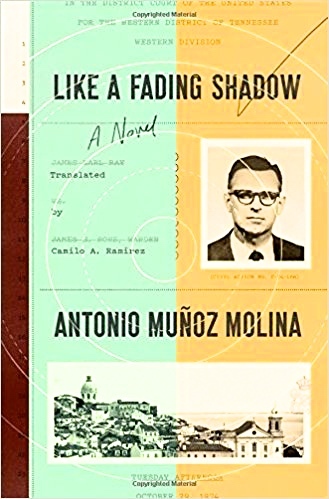 A quick cut to Munoz Molina shows him contrasting his own life with that of his son, detailing some of his research in Lisbon and in Memphis for this book, as he brings the reader up to date on the events from his own life – his divorce when his oldest son was five – and his new life and love. Ultimately, he even creates a climactic chapter in which Martin Luther King himself becomes the speaker on the last day of his life, revealing information about his personal life which only researchers into the life of Dr. King would probably know. The novel winds and twists, has many different ideas and directions, and talks about fiction and its writing, its differences from journalism, its responsibilities when dealing with real events, and its long-term value. Throughout the novel, the author ignores many of the standard “rules” regarding the overall organization of his narrative, with the point of view and the time frame of the action changing back and forth throughout the separate sections. King is assassinated early in the novel, but he and Ray are both further developed throughout the book, including in its conclusion, as a result of Munoz Molina’s research – and speculation. To this extent the novel may be considered “experimental.” The author is taking his chances with the reader, trusting that the reader will want to discover as much as he himself has discovered regarding the events in Memphis and the people involved in them. He also wants to show how he himself became involved in this story and to show how he came to write this novel, the weaknesses he sees in his own early writing and the changes he has instituted with maturity. Fiction is alive and well here, whether it be the author’s lifelong work as an author, Ray’s written attempts to convince authorities that he is innocent as he faces a lifetime in prison, or Munoz Molina’s son’s excitement about translating and living a life through filmed events, and that supersedes any limitations of the narrative order, at least for me.